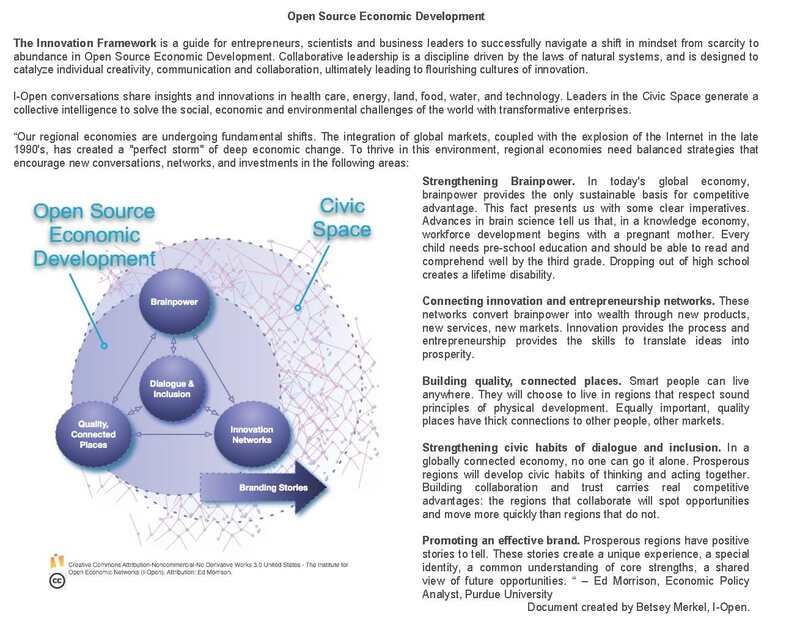 The Institute for Open Economic Networks (I-Open), an educational initiative that develops and deploys new practices and tools in Open Source Economic Development. You can read more about I-Open below. In 2005, I co-founded the Institute for Open Economic Networks (I-Open). I-Open is a spin out of Case Western Reserve University's, Weatherhead School of Management with an educational mission: to develop and deploy new practices and tools in Open Source Economic Development that strengthen and accelerate the adoption of innovation based network strategies by communities and regions for global competitiveness. Open Source Economic Development is based on a heuristic model of strategic investment, the Innovation Framework. The Innovation Framework is a universal guide for people, projects and organizations to identify and connect creativity, collaborate, and align collective action for transformative action. It has been successfully applied by communities, organizations, governments and regions to shift to open networks of collaboration, the essential work of technology-based economic development. My founding I-Open colleagues were Susan Altshuler, Matt Kozink, Dennis Coughlin, and Ed Morrison. Ed Morrison is currently Economic Policy Advisor, Purdue Center for Regional Development. While at I-Open, Ed coined the phrase, "Open Source Economic Development", designed The Innovation Framework, and formed Strategic Doing. Learn more about Ed's work at Purdue University here. I hope you'll add The Institute for Open Economic Networks (I-Open) to your bookmarks, create an I-Open account to get the latest updates, and read the fascinating contributed guest articles at the I-Open Blog here. We would be grateful for any contribution you could make to I-Open, from adding your supportive comments, to contributing an article to our blog for sharing, suggesting great resources, volunteering a little time or making a donation. Please make checks out to the “Institute for Open Economic Networks (I-Open),” and mail them to: Institute for Open Economic Networks, 2563 Kingston Road, Cleveland Heights, Ohio 44118. If you would rather donate by credit card, simply send your donation directly to I-Open by clicking on the secure PayPal donate button below.